This photo was sent to us by Jamie Brickell (#779) who provided the following description. Can anyone else identify who is in the photo? 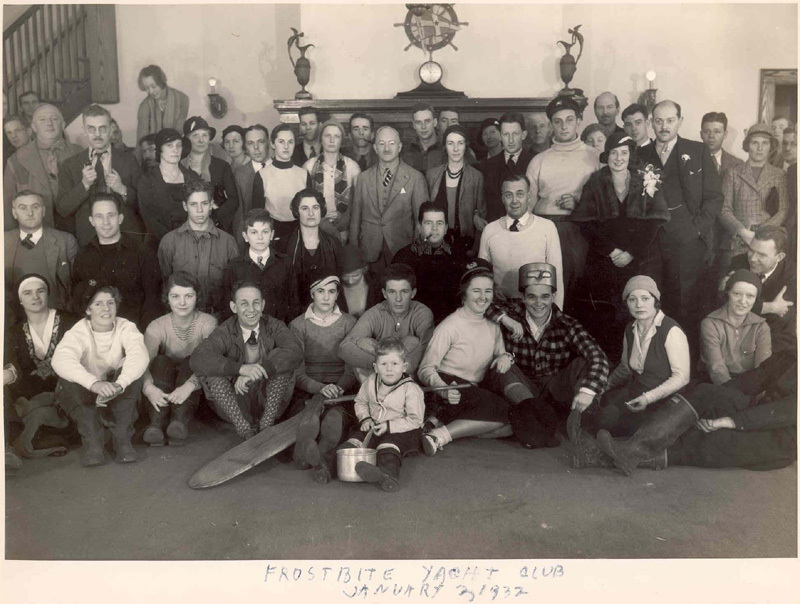 It is a photo taken on Jan 3, 1932 at the establishment of the Frostbite Yacht Club at Manhasset Bay. My cousin Corliss Knapp Engle sent it to me. She is the daughter of Arthur Knapp, Jr. and discovered the print while cataloging his papers in preparation to sending them to the archives at Mystic Seaport. In the first row is my mother Allegra Knapp (Brickell Mertz) at the age of 19 holding the head of the rudder. Also in the first row is Lorna Whitelsey (Hibberd) wearing the captain’s hat and holding on to the end of the tiller. 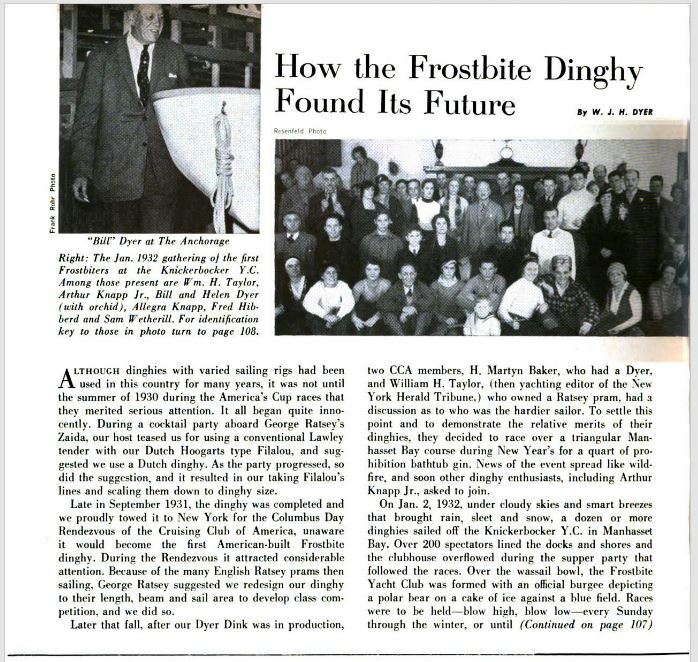 In the back row is my uncle Arthur Knapp, Jr. with his ever present pipe standing (as you look at the photo) between the lady in the wool cap and checked scarf and the gentleman with the vest and stripped tie. The lady in front of Arthur Knapp, Jr, to his right, with the wool cap and checkered scarf is his first wife Dorothy Roan Knapp, the mother of Corliss Knapp Engle. There is a chapter in Uncle Arthur’s book titled “Race Your Boat Right” [Editor: here are three pages from the book: one, two, three] describing the start of frostbiting if you want more information from one on the first eight (if I remember correctly) frostbite sailors. 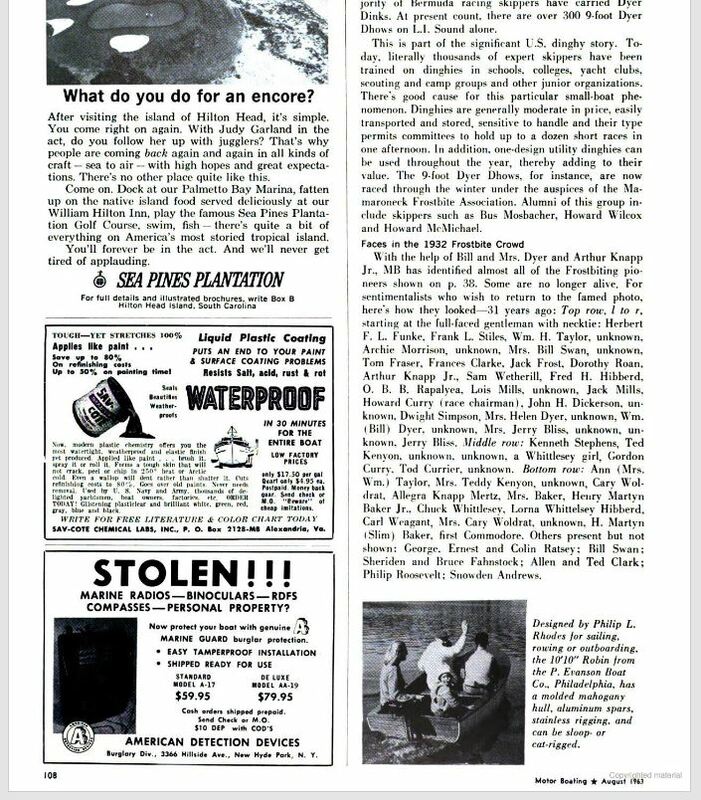 Update March 2019: Thanks to Emily Mayotte of the Mystic Seaport Museum for directing us to the August 1963 edition of Motor Boating Magazine which has the above picture by Mr. Rosenfeld along with an article about dinghy sailing.